The Transition Movement is a method of community organizing and education that builds broad, grassroots support for sustainability while increasing resilience to the climate change, energy and economic crises. The future will be increasingly low carbon and local. Engaging people now in a planned transition will ensure ways of life that are more abundant, fulfilling, equitable, sustainable, and socially connected. Since emerging in Ireland in 2005, the Transition movement has spread virally across the UK and beyond, with hundreds of Transition initiatives now underway. Learn about this rapidly growing global movement. Tina Clarke of the Sustainability Institute has served as director of Greenpeace USA’s citizen action network and as campaign director for Clean Water Action. The Training will show you how to set up a successful Transition Initiative, or to enhance current sustainability projects. Receive imaginative and inspiring tools for community outreach and engagement. The talk is free, but the subsequent workshop, held over Saturday and Sunday is $250. On July 18th thousands from the Tri-State region will float, ferry, paddle, row, splash, canoe, and kayak their way to beautiful Governors Island for the 2nd Annual City of Water Day Festival. 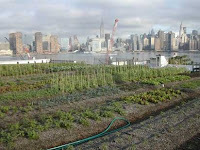 Rooftop Farms, a 6,000 square foot organic vegetable farm in Greenpoint, Brooklyn. 2pm Free workshop on urban gardening and farming. Troubleshoot, ask, grow! The tour on July 19 (register now!) begins in the West Village and ends in Soho. It features a wonderful green bakery, two beautiful community gardens, and a couple of charming green boutiques. The last stop will be the new Green Depot store in Soho. The tour on Sunday, October 25 (register now!) is in Park Slope, Brooklyn. It features a couple of charming green boutiques, 3R Living, a wonderful Revolutionary War museum, and a community garden. All tours have plenty of opportunities to stop and rest, buy a beverage, or use bathroom facilities. The Food Bank For New York City Young Professionals and James Beard Foundation Greens present The Farm Stand. Proceeds from this event will benefit the Food Bank and the James Beard Foundation. Proceeds will go towards purchasing farm shares at Roxbury Farm to help fill the Food Bank's Community Kitchen & Food Pantry of West Harlem with seasonal fruit and vegetables for hungry New Yorkers. Tickets available now at the New York Charities website. Early Bird ticket prices available for a limited time only. Click here to buy your tickets now. General Admission: $150 - early bird $125 VIP: $235 - early bird $215 This year, we will offer tastings from more than 30 of NYC's best restaurants and food producers, including: Angelica Kitchen - Aureole - Blue Hill - Candle 79 - Cookshop / Hundred Acres / Five Points - Da Silvano - Dirt Candy - Gramercy Tavern - Great Performances - The Green Table - Jean Georges - Jimmy's No. 43 - Marlow & Sons - Mas - Pure Food and Wine - Rose Water - Rouge Tomate - Saul - Telepan - The Tipsy Parson - Join us as we celebrate Just Food's delicious mission -- to connect New York City residents with sensational, seasonal, locally grown food.